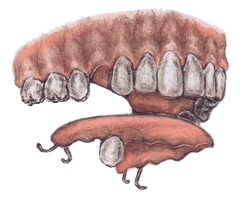 A traditional bridge involves grinding down the adjacent teeth to support the bridge. It’s stable and is fairly easy to install. 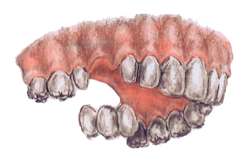 However, there are two disadvantages: continuous bone resorption in the edentulous area, and sacrificing healthy teeth on behalf of the bridge. This is NOT a permanent alternative to a lost tooth. It’s loosely attached, which affects both function and comfort. 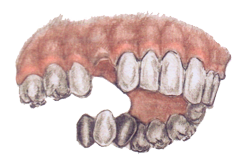 A removable partial denture is made of plastic, which unfortunately can’t create the same aesthetic result as a ceramic crown. There are, however, a few benefits: adjacent teeth aren’t affected, it’s relatively cheap, and it’s easy to install. This option is also not permanent – the resin-bonded bridge will come off after a couple of years, and will then have to be re-installed. However, there are a few advantages, including: it’s quickly installed, functions well, and since it’s made of ceramics, the results are aesthetically-pleasing.